Did you know that the majority of marketers believe live events are critical to their company’s success, yet 80% of trade show exhibitors don’t follow-up with their show leads? Surprisingly, statistics shows that less than 70% of companies develop a plan for following up with prospects after events. Very few companies follow-up with prospects who registered for the event, but were not able to attend. What a lost opportunity! So much time and effort goes into organizing a stellar event that sometimes all sight is lost of the importance of creating an event follow-up strategy. After all, what’s the point of organizing an event and getting feet through the door if you’re not going to follow-up with the owners of those feet afterward? By letting the actual event planning take precedence over developing a post-event follow-up plan, you are sabotaging your company’s business development efforts. In order to avoid this, you must put time and effort into developing a post-event follow-up plan, which will turn promising leads into loyal customers. In the chaos and excitement after the event, you will be grateful that you have done this beforehand. Event follow-up emails are a great way to keep new and existing leads engaged with your brand. Most marketing experts suggest that follow-up emails should go out within four days of the event. Some even suggest sending these out during the event. This makes sense – as exciting as an event may be, the harsh reality is that with each day that passes, each attendee remembers less and less about the information shared with them at your event. The email you send after your event should thank attendees for visiting and highlight the goals of the event and how it benefited those who attended. It should also contain a commitment that you or another team member will contact them again shortly. It’s not good enough to have a lead’s basic contact information. Make sure your team gathers more specific details from prospects they interact with at the event. After speaking to the prospect, make some quick notes on their business card (or preferably in your CRM system). Note any salient points about your discussion and any pertinent information you learned. You may also note buying cycles, budgets, and other applicable information. Add these details to your lead system in order to be able to bring up these points in future conversations with the prospect. Use your notes to categorize leads into hot, warm and cold. Hot leads will usually stand out and should be flagged for prompt follow-up. This is important if the sales team must execute the follow-up, but did not necessarily come into contact with the prospect at the event. Before the event, decide with your team what type of lead would be considered hot, warm or cold. It may be challenging to immediately follow up with all the prospects you had a conversation with at the event, so prioritize those you identify as hot leads. Use the notes you took at the event when you call the prospect. Hot leads need to be followed up on within three days after the event. Mention some personal details and highlight the needs of their business and how you can add value. This will help you to build a solid base for your relationship moving forward. For warm and cold leads, offer something of value with your follow-up email. Send them content that would be relevant to their business. Think in terms of an eBook, an industry infographic, a link to your blog post on an industry challenge and how to handle it, or a live demo of a product that they could use in their business. The leads that make use of your offer by downloading your eBook or infographic or by clicking on your blog post become your next targets to follow up with. Contact them by phone to find out what their interest in your business is and how you can be of further service to them. The initial follow-up email reintroduced you to your new leads, so this next email should remind them of the business discussion you had. Now is the time to use the information you noted during the event. Use this in the subject line to draw their attention. Let your lead know how your business can be of service to them and be very clear on how they can work with your company. Be sure to include a specific call to action. Some marketing experts engage with attendees after the event by asking for their comments to be included in an article that will be published online. You can ask a few attendees for their comments on the event, the speakers, what they learned, ways the event benefited the industry, etc. Later when the article has been published, you can include a link to the article in a personal email to them. This is an excellent way to build your own brand image while boosting the image of your attendees as well. Remember: an introduction at an event is just that – an introduction. You still need to develop a relationship and an effective follow-up strategy to cement a solid foundation with your lead. Without that, your event will have failed in its purpose. Allowing for individual differences, it takes an average of seven “touchpoints” to convert a prospect into a customer. In terms of events, this process starts with an effective post-event strategy. 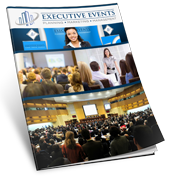 Executive Events is ready to help you plan and execute the perfect post-event strategy. Contact us today to discuss the best strategy for your business.